How Ukrainian is ‘A Short History of Tractors’? The Ukrainian flag is two oblongs of colour, blue over yellow — yellow for the cornfields, blue for the sky. 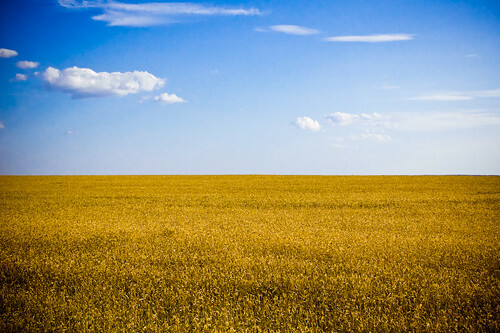 The color blue of the Ukrainian Flag represents the color of the sky, and yellow symbolizes the lush golden wheat fields of this country. And while it’s a good novel and has won all sorts of awards, Marina you’ll have to do a better job when you represent us! Possibly something that got lost in translation. In English English wheat has also traditionally been called corn (eg John Constable’s famous ‘Cornfield’ painting), but in American English corn only means maize – a different plant altogether. Hmm you might actually be right http://bit.ly/WlBO I’ll have to check the book to see if it has a lot of English references, but to use country specific terms like that is really confusing. If you do a search within the book you’ll find references to both corn and wheat fields, so I would lead towards the author’s intention of corn meaning maize. Hm, I don’t have the book in hands right now, but I will check how it was translated in brazilian portuguese too. In brazilian portuguese it was translated as “milho”, maize. Too bad.